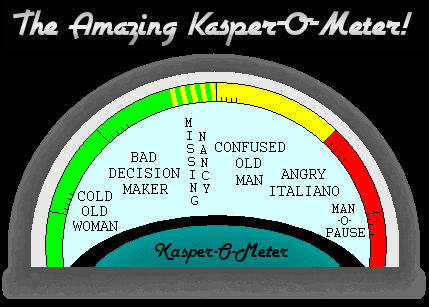 Just scroll over the described Vince Kasper event and see what the Kasper-O-Meter reads. Vince begins to complain about the way Horizon behaves and slaps the desk with his hand. Vince is in the men's room stall cursing the toilet paper for not dispensing properly. Vince quips that; "It must be nice over at the Mohigan Sun." Vince is telling you about a problem he is troubleshooting and he uses the term "Active Directory" several times when he clearly means "Ace." Vince is working in his fleece jacket and it's July. Vince slowly looks around the call center and sighs as a female co-worker walks by.